Nationwide protests in the defense of Black Lives have taken a precise turn into the world of economics by encouraging Blacks everywhere to only support Black-owned businesses throughout the Thanksgiving Holiday leading with the famed “Black Friday” and “Cyber Monday” and ending Jan 4, 2016. Activists are calling out the national Black community to invest in Black businesses only as a sign of economic protest against the unfair treatment of the Black community here in the United States, specifically in the area of police violence. In response to the murder of an unarmed Black youth, Michael Brown, in Ferguson MO. members of the Justice Michael Brown Leadership Coalition and various other groups started the “No Justice, No Profit” economic boycott of malls across the nation. Reasoning that a silent protest of economic power will help shine light on the movement as well as the injustices and disparities faced by the Black community at large the first demonstration was held last November during the Black Friday and Cyber Monday sales period. Hoping to gain more steam this year, the boycott intends to spread from Missouri throughout the rest of the country according to the website, nationalblackout.org. Organizers said this economic boycott will showcase the sheer force of the buying power in Black America. such as music mogul Russell Simmons and actress Niecy Nash under numerous hashtags. 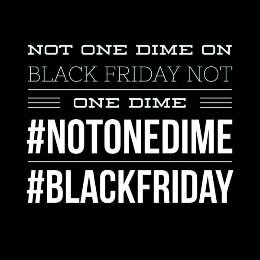 The most commonly used two are #BlackoutBlackFriday and #NotOneDime by the organization Blackout for Human Rights. The organization is a network of artists, activists, filmmakers, musicians, and citizens who want to shine a spotlight on the repeated violation of human rights here in American. Since its inception the group has spearheaded many events and protests throughout the United States bringing awareness to the racial disparities faced by minorities. The diverse members of Blackout for Human Rights are individuals known in entertainment and community outreach, including its founder Ryan Coogler, director of award-winning “Fruitvale Station” in 2013. The website releases a stream of short films, infographics, and more information geared to raise awareness and empower people to stand up against injustices. Under the similar mission and scope #NotOneDime was created by Rahiel Tesfamariam a social activist and journalist who founded Urban Cusp, an online publication. Tesfamariam created a meme including the #NotOneDime and featured it on the cover of her magazine which immediately saw some traction. Tesfamarian has said that this movement can show the influence that Black consumers have and the power of the dollar. Other major public figures have stepped up to call for this economic boycott with movements like Justice or Else with Nation of Islam Minister Louis Farrakhan spearheading this effort. During an interview with News One Now earlier this year, Farrakhan spoke about the purpose of this boycott for the Black community and proposed to extend it throughout the Christmas holiday. Farrakhan also urged Black people to spend money within their own communities instead of spending it elsewhere at larger chain stores. Last year, Black Friday profits dropped to 55.1 percent from the previous 58.7. Many attribute this decline to online shopping but others tend to think otherwise as online shopping predates the time of the boycott. Many skeptics are hold reservations to the effectiveness of such a boycott; however, numbers show that with enough backing that this tactic could prove to be a very effective tool in racial reform here in the United States. According to a report conducted by Nielsen, Black consumers nationwide had a projected buying power estimated around $1 trillion in 2013 and could grow up to $1.5 trillion by 2017. Putting the total amount spent to be equivalent to roughly a third of the total revenue of the federal government which is approximately $3.5 trillion in the fiscal year of 2014. Nielsen also shows that the Black consumer is the most aggressive and relevant buyers in the U.S.
On average, Blacks make 156 shopping trips favoring small retail stores such as convenient stores, drug stores, and the ever growing dollar stores. Also the average Black household places value on short term purchases rather than long term “stocking up” purchases making more trips to gas/convenient stores at 17.4 in comparison to non-Blacks who go 12.7 and nearly twice as many trips to dollar stores at 20.7 trips against others’ 11.4 according to a comprehensive study of the Black consumer base by Nielsen. This spending habit is overwhelming in comparison to the astonishing rate at which Blacks make up the number of those facing poverty in American which is 27.4 percent according to the National Poverty Center. While the numbers on this topic is highly limited due to lack research interest in this area, the studies done show the impact that the Black population has on the American economy. Only occupying an approximate 13 percent of the total population the staggering $1 trillion spent places Blacks above many countries such as Argentina, Egypt, and South Africa whose entire GDP (purchasing power) doesn’t even break into the trillion. The estimate numbers for 2017 would place Blacks in the top 20 of world’s richest countries while only seeing a one percent increase in population. Areas highly populated with Blacks tend to be towards the Southeast and Midwest of the United States inhabiting major industrial and metropolitan cities such as Atlanta, Houston, Dallas, The District of Columbia, Los Angeles, and New York. Louisiana consists of roughly 4.6 million people with Black population ranking second at 1.4 million according to the U.S. Census Bureau. When comparing the number of how much they spend per trip at superstores (on average $52.60) with the total population the amount that could be seen from this demographic alone could reach up to or even surpass $70 million in a year in Louisiana alone, based off of one trip per household. The numbers only increase from there if the total amount of trips per year were factored in. Reach of company influence in the market place also plays a big role in attracting the consumer base as the Black consumer absorbs more media than any other group watching 40 percent more television and talk twice as long on the phone in America. Expenditures reached an estimated $1.9 billion for Black media in 2010 on advertising alone. This presents a large opportunity for small retailers and convenient stores in the community to see an added growth in revenue if properly marketed to the demographic. Untapped geographical areas with limited access to larger resources could benefit from the spending habits of Black consumers as they have been proven to be more brand loyal than most demographics. By appealing to the Black consumers through the most influenced advertising methods smaller, Black-owned business can tap exclusively into the buying power of the area they reside as convenience, health, beauty, and dollar stores see more Black dollars spent than any other retailer.